The world of Japanese domestic market automobiles is a large and exciting one. For decades people from across the world have been lusting after the special machines sold in Japan’s home market, and many of them are globally known and loved. The Nissan Silvia is one of those cars, along with the Mazda RX-7, the Toyota Celica and Subaru Impreza just to name a few. But along with those universally popular cars, Japanese automakers have also cranked out some much more obscure, but equally interesting vehicles over the years. These cars might not enjoy the same recognition and international following as their more favored counterparts, but for Japanese car geeks they are every bit as cool. For every Integra Type R there’s a Honda City. For every Skyline GT-R there’s a Nissan Leopard. 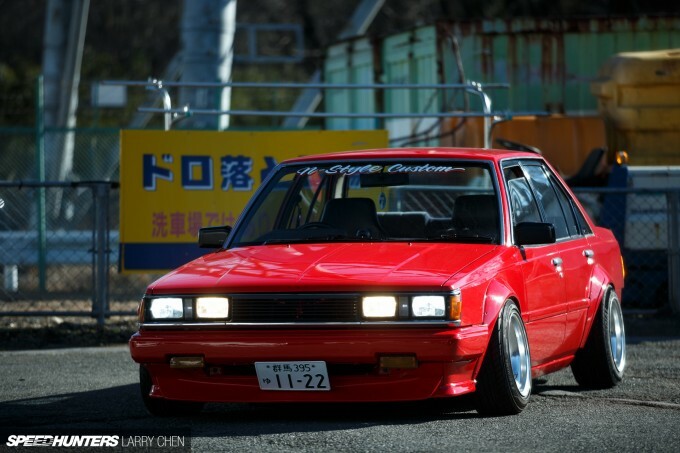 And for every AE86 there’s a Toyota Carina. The Carina was introduced in 1970 as an intermediate model in Toyota’s lineup. Available as a coupe, a four-door sedan and later a wagon, the Carina slotted in between the small Corolla and Toyota’s larger sedan offerings. It was also aimed more toward the enthusiast side of the market, with the first generation cars sharing their underpinnings with the Celica. While it never enjoyed the widespread popularity of the Celica, the Carina continued to occupy a unique space in Toyota’s range. It delivered a decent amount of space, along with a tighter, more sporting character than you’d find in larger cars like the Mark II, which were aimed more toward the luxury/comfort side of the market. With the introduction of third generation A60 model in the 1980s, the Carina continued to serve as a unique choice for those looking for a practical rear-wheel drive experience. It was even used for competition in the Paris-Dakar rallies during the early part of the decade. 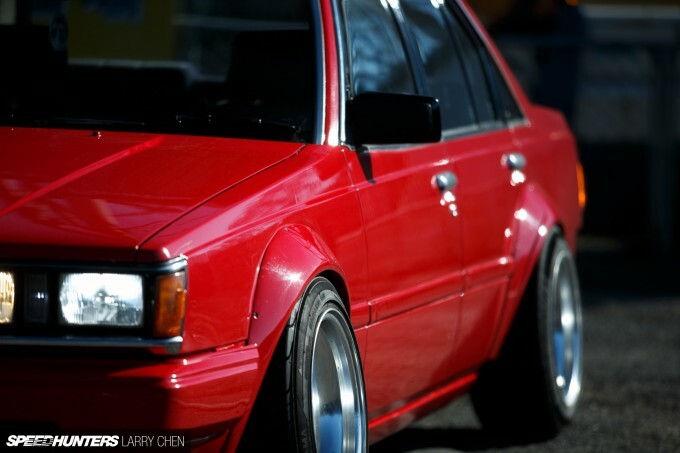 The A60 Carina was available with a few different engine options, including a 3T-GTE turbo four cylinder and the legendary twin cam 4A-GE made famous in the AE86. 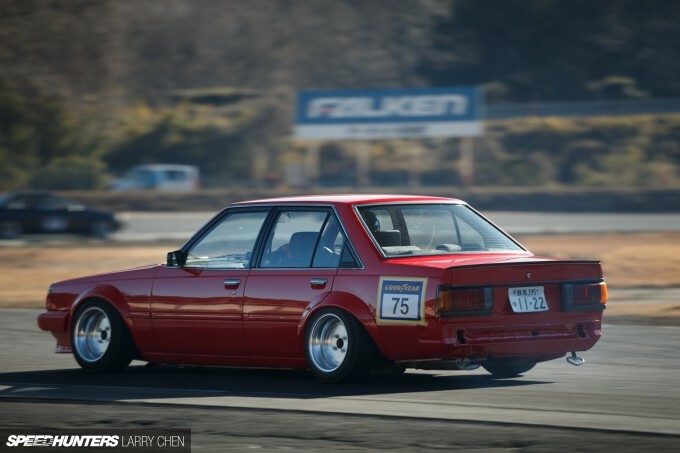 And because it shared the Hachiroku‘s engine, as well as a similar footprint and styling, in many ways the A60 Carina sedan can be considered a four-door AE86. It’s thanks to those attributes that the Carina has developed a cult-like following among drifters and Toyota enthusiasts. 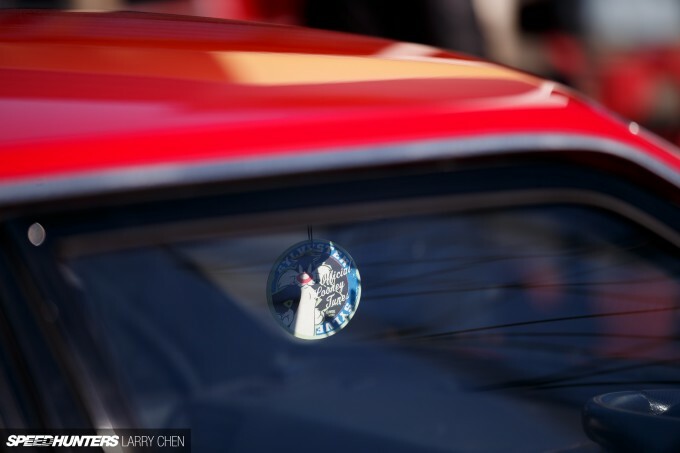 One of those Carina lovers is Nakamura-san from the N-Style crew in Japan, who Larry recently met during a drift day at Nikko Circuit. 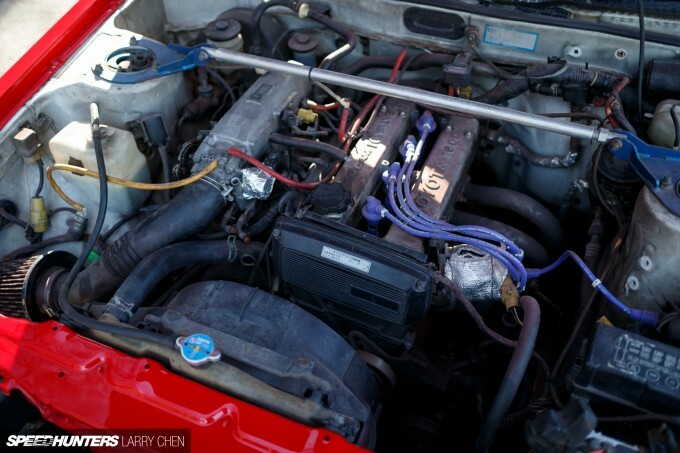 Despite their age and rarity, A60 Carinas can still be had for cheap, and Nakamura’s car is the perfect example of street/drift car built on a blue collar budget. 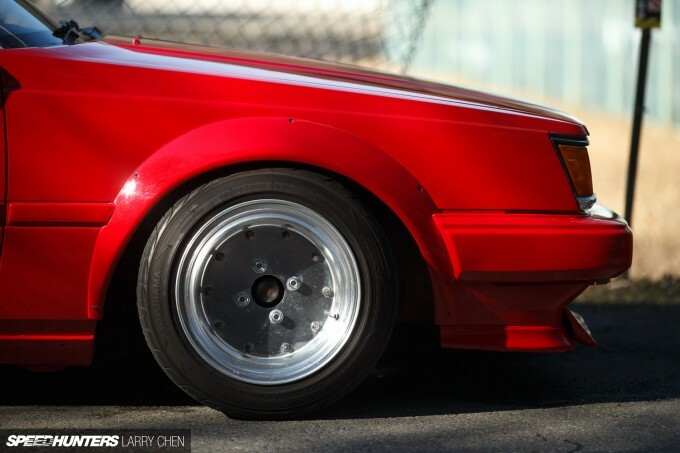 In terms of exterior styling, Nakamura has used the same techniques that many of his AE86-driving friends have applied, letting the angular early ’80s lines do most of the talking. 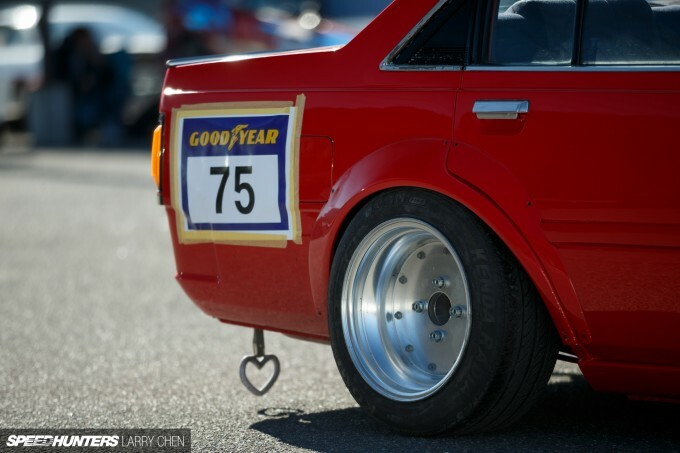 The body of the car remains largely original with the primary additions being a subtle chin spoiler up front, and most notably a set of N-Style’s custom-made over-fenders, which help add some aggression to the Carina’s boxy profile. Nakamura also removed the Carina’s rear bumper and then had the entire car painted in coat of bright Ferrari Rosso Corsa red. Because why not? The sedan has also received plenty of attention in the suspension department, mainly for more athletic movements at the track, but also to give the Carina the same aggressive stance that all N-Style cars share. Up front it’s running a set of adjustable coilovers, while the rear is home to a pair of modified shocks with custom aftermarket springs. 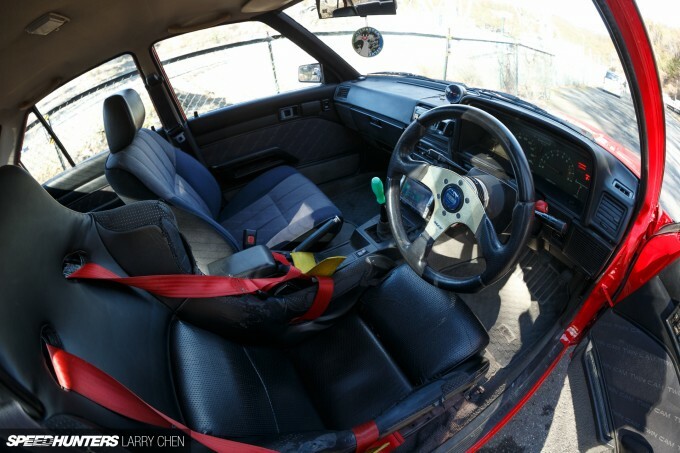 The Carina has also been fitted with drift car necessities like adjustable arms, and upgraded knuckles and tie rods. 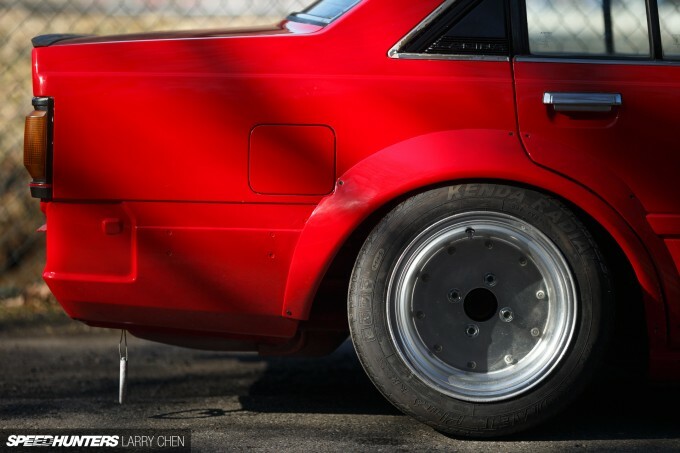 Like his Corolla-owning buddies, Nakamura has run several different sets of classic Japanese wheels on his Carina, and on this day the car was equipped with a set of deep-barreled SSR MKIs. The wheels measure 14×8-inch all around, and spacers have also been added to both the front and rear to further push them outward. Under the hood sits the venerable naturally aspirated 4A-GE, but rather than going for big power, Nakamura has kept his engine modifications simple to promote reliability. Changes include upgraded plugs and wires, an aftermarket header and air intake along with a subtle custom exhaust system. The trans is a 5-speed stick, and a Cusco LSD helps to ensure that the modest power is correctly put to the wheels. 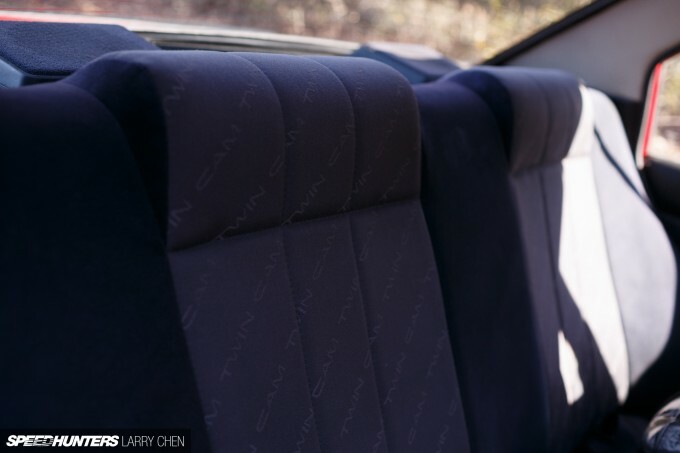 The interior of the Carina has the same straightforward vibe as the rest of the car. There’s no rollcage, and because the car sees plenty of street use Nakamura has refrained from gutting the cockpit. 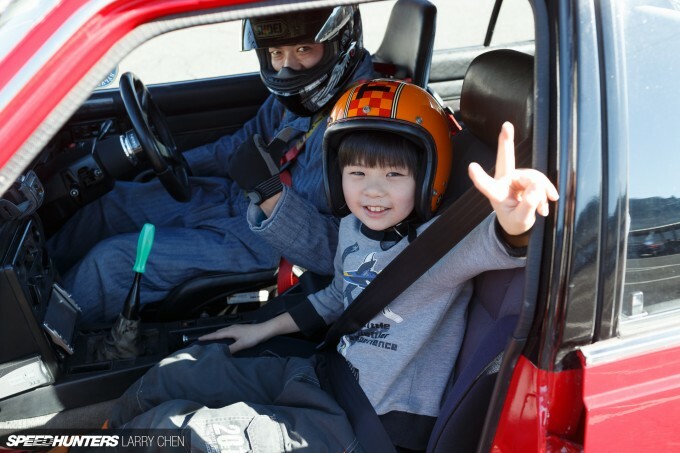 He sits in a secondhand bucket seat while the rest of the car’s seating is factory original. 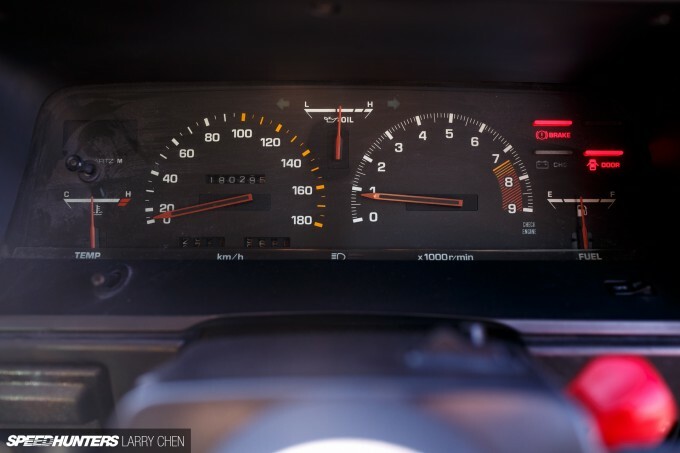 Other touches include a Nardi steering wheel, an aftermarket vacuum gauge, a double-DIN head unit and the classic screwdriver handle shift knob. You know you’re in a car from the 1980s when you see the words ‘Twin Cam’ upholstered endlessly across the seats and door panels. Gotta love it! While we love sharing stories of mega-horsepower, incredible fabrication and big budgets, the truth is, these grassroots cars are just as important. What they lack in exotic materials, they more than make up for with a whole lot of style and spirit. As we’ve shown time and time again, in the world of Speedhunting a car doesn’t have to be expensive and exotic to excite us, and this Toyota is a great example of doing more with less. It’s stylish, unique and most importantly the owner squeezes out every last drop of enjoyment the car has in it. 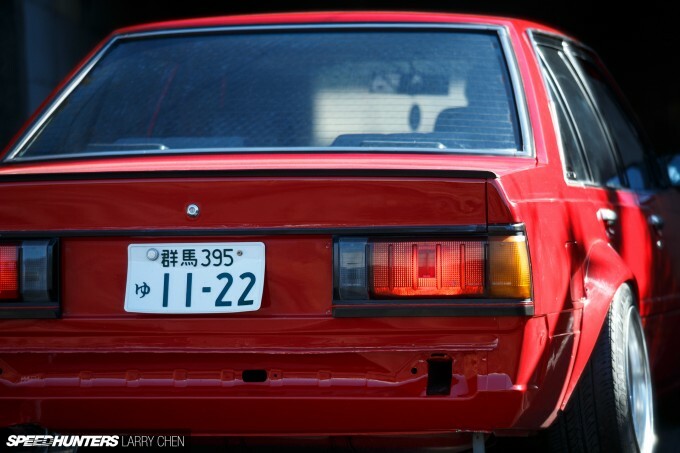 The Toyota Carina might not be the internationally-known JDM dream car, but to us that’s just one more thing that makes Nakamura-san’s little red sedan so special. There is something about that 80's designed-with-only-a-straightedge, what-is-a-curve? style that is just awesome. Put it together with a stance that is very much form following function and it just works. Wow the best article in the last months. I really really enjoy reading through grassroots car story, they were the reason for me to start wasting my time (in the good way) on speedhuntersin in the first place. You're right the seats are the sh*t! The Carina with the 4-AG had a huge disadvantage. It was heavier. The 4-AG engine was dropped in every rear wheel drive Toyota then as a modification by street drifters. I loved the Toyota Starlet KP with the 4AG's dropped in them. They were crazy light. 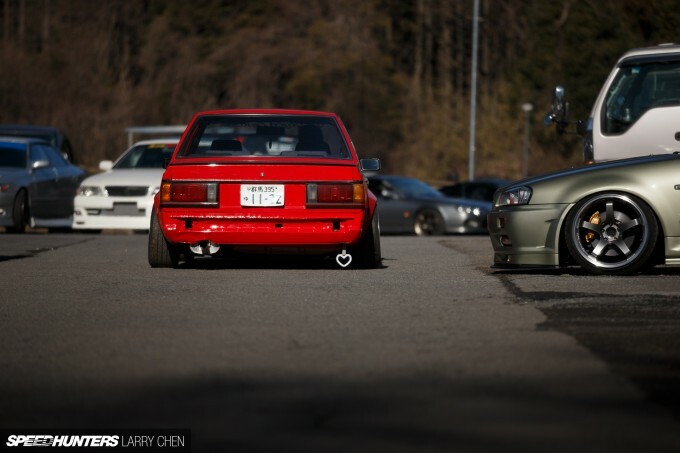 The Carina that was way better was the GT-TR. A Yamaha built engine that was turbo charged. Turbo DOHC engine (3T-GTEU, 1,770 cc and 160 PS (118 kW). I had a friend who had the very limited rally version engine. Rally back then had less strict rules for mass production. I think only 228 were made. So he had the elusive 4T-GTEU. 3T engine would have fit snugly under the 2.5-liter limit, but being in the larger class allowed Toyota to stretch the 4T-GT engine to 2,090 cc (89.0 x 84.0 mm for a converted displacement of 2,926 cc) which better suited the comparatively heavy Celica. 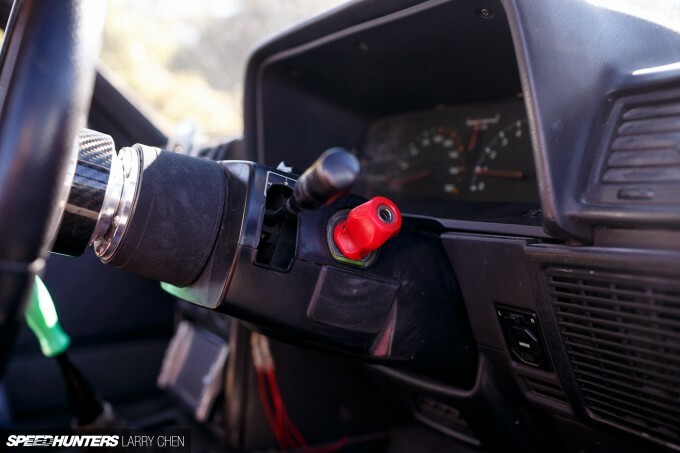 Why is it that it almost seems that the only steering wheel Speedhunters seem to think of is Nardi, even when this car is running a Momo Race. Good to see someone running a Momo. Love this article. Small budget, big smiles. The photo of what appears to be him and his son stood out for me. Don't need a lot of money to have fun sharing a passion and putting a smile on the faces of the people we love. Go go grassroots! 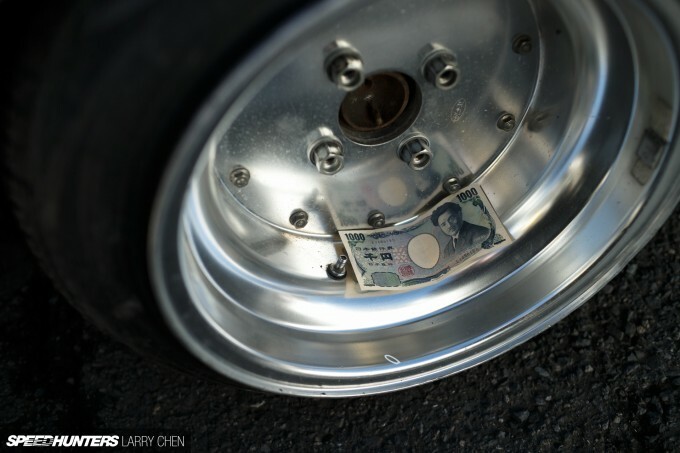 @Speedhunters Has someone done a article on the greenish r34 in the second to last bonus picture? Love the N-Style cars. This thing is sick! Ive always loved N-style cars. Simple yet functional. this car is awesome, i love old toyotas, but......the bumper-less trend needs to stop! Corona/Carina was one up Corolla/Sprinter in term of size , so they're more of less Camry of today , but RWD ... I love the natural high revving of 4A-GE , and the sounds of the rev happy small engine , but I do agree it might not really enough for Corona/Carina since it wasn't as light as the Corolla/Sprinter . I wonder , how difficult it would be , to stuff a 2ZZ & W58 in one of those ? Imagine 180hp & stronger 5MT , should be fun ! RDS you can easily fit a 1uz in these. ae70 I totally agree with the bumper less trend, but this car does have a ugly bumper with faded out rubber trim that usually is sagging. They should try to atleast customize it and chop it down. I believe that this car would look better if it was on a set of Watanabe RS! wtf... I know a lot of old toyotas and I still find new ones. 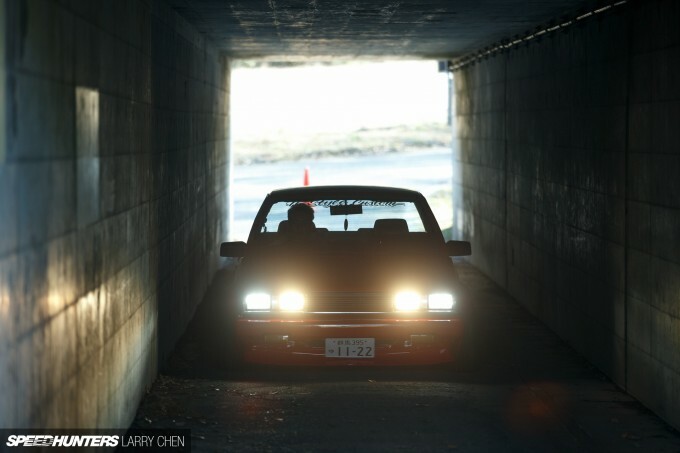 Awesome example of this series, I kept reading thinking I would find the headlights were swapped off another toyota chaser or something. Thanks Mike and Larry for sharing the love for old Toyota Carinas. As an owner of an A60 Carina I've been following the N-Style Carina for a while. I've seen the overfenders for sale for some time now and asked N-Style if they could export them, but so far I haven't received a reply yet. Maybe I should contact them once more. About the weight of the Carina AA63: it is a tad bit heavier than the AE86. It is about 120kg to 150kg depending on the model. However if you take the live-axle model (AA60 or TA60) and swap the engine for the 4AGE you should be able to get into the AE86 regions. ryukyustriker Only about 120 to 150kg more than the AE86. The Celica was even heavier thanks to its US bumpers and reinforcements. I really want to know how they made those custom over-fenders ???!!! Carina is the 4dr 86, and Laurel C33 is the 4dr S13... great story guys. The car is from the 80's. They sold over fenders that for a lot of cars back then. They even have guys make a custom set for dirt cheap. They have excellent mechanics and body guys every where in Japan. The regular route for guys is usually find the rim set up they want . Then the body guy cuts off the stock fender and makes a custom metal fender to fit that rim. NigelWheatley What are you talking about? 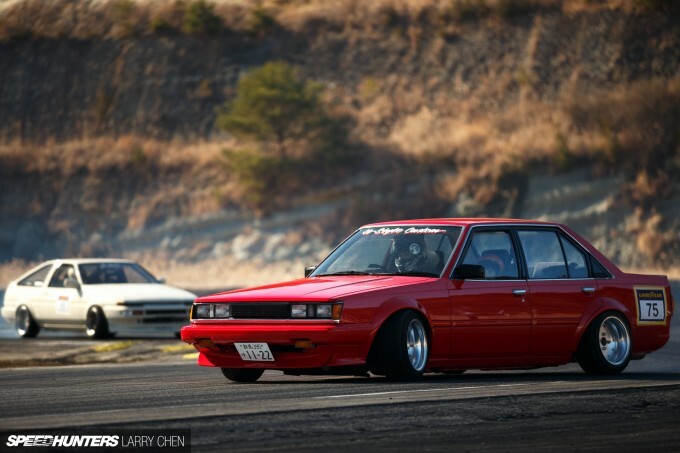 The only think that Is similar to the Slivia S13 is the suspension. The Laurel C33 car is the same platform of a Skyline Type M. Just like the Cefiro. RB20DET a six cylinder engine. S13 SR20 four cylinder engine. ryukyustriker NigelWheatley Also the Carina GT and GT-T don't share the rear suspension of the AE86 as it has got IRS. So now every similarity is gone. MOU89 Those aren't custom over fenders on the Carina, but kinda like a general purpose ones I think. They modified the rear ones for the door. It was done with a air saw for sure then just glassed over. I might be able to look them up ,but of course its a Japanese company. 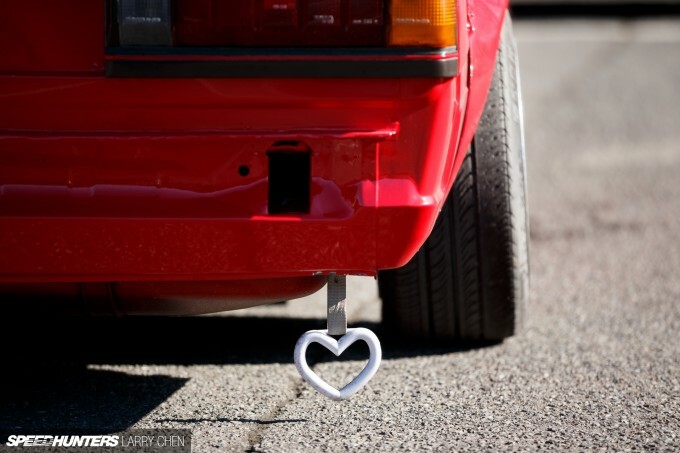 What car are you trying to put them on? Max W Thanks Max, glad you liked it. banpei_net ryukyustriker HAHA even the AE86 in America had a huge bumper. We called them BBQ tail gates. I grew up in Japan for 31 years and when my friends moved to the states for college they all got AE86's when nobody knew their worth in America. They all asked for help locating Japanese bumpers on their summer or spring breaks when they returned. So we went junkyard shopping locating the bumpers of KOKI type. The miracle of trying to find them and turn signal lenses that were clear. Jesus was that a struggle. I need to correct myself. They did indeed bring some cool RWD-sedans to german shores but I've never NEVER seen an A60 Carina in real live... ever. We got a lot of e30s tho. ryukyustriker MOU89 I was just curious. Can somebody please tell me where you can get that looney tunes air freshener? It looks awesome! MOU89 N-STyle (Japan) Make and Sell Them. More of a 4 door celica ra65 than an ae86. Ke70 would be a 4 door ae86 if you were to make the comparison. Seeing as they share virtually everything and the carina shares zero. So they're not all IRS? Like the guys above saying? Exact same looking body style? Well , I meant stick with high revving straight-4 wise , since 2ZZ is like half of weight of 1UZ as I understand , although 1UZ have twice the torque & probably cheaper , a lot cheaper . banpei_net ryukyustriker NigelWheatley All I am talking about is four doors. (I just think four door sports cars are cool). But thanks for the info guys. 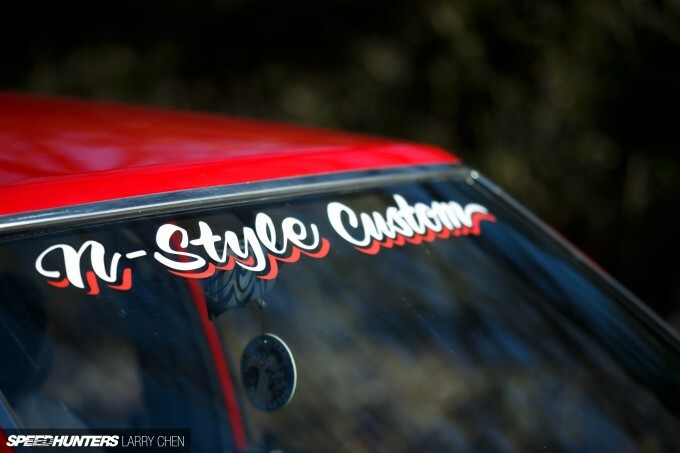 More toyota epicness...Ilove the fact that old school toyotas still roll around!I just wish some day that I will see a KP60 Starlet being featured here!I've seen every other toyota being featured bar from this mini-AE86!Good article btw guys...keep on bringing more grassroots builds! This is a sedan I could see myself driving! Very cool. beally Exactly right, I've owned both a TA60 Carina and I now own a KE70. 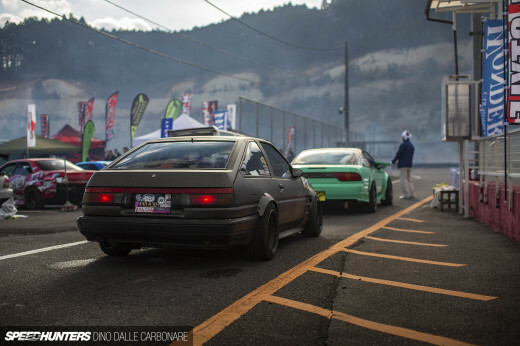 I can confirm by experience that the TA60 doesn't really share as much with the AE86 as the KE70. My TA60 did have a T50 gearbox like the AE86 but a 3T engine. These are my favorite features. No crazy engine swaps, $20,000 worth of upgrades, or insane body mods. Just a good looing car with minimal, purposeful upgrades. A 2ZZ is a yuck option as there are no mounts of the side of the block for mounting in North South. My Carina (coupe) has a beams motor in it as you can get engine mounts from a Carina/Corona/Celica which came with a 1S or 2S engine to plonk it straight in. And a W series drive shaft slots into the Altezza 6 speed box so it's all to easy. With full interior except for sound deadening, my car is just under 1000kg with an empty tank of gas. beally this is exactly correct. kind of an odd oversight for such an "auto-otaku," mike! 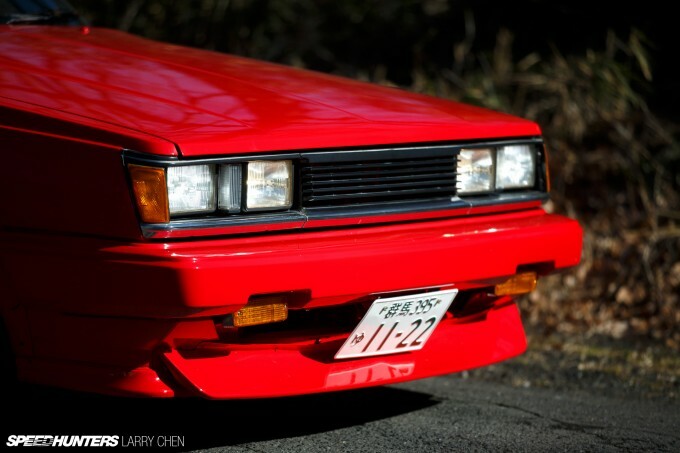 Ready or not, the true four door AE86 is not a Toyota, but a Daihatsu. Daihatsu Charmant to be exact. 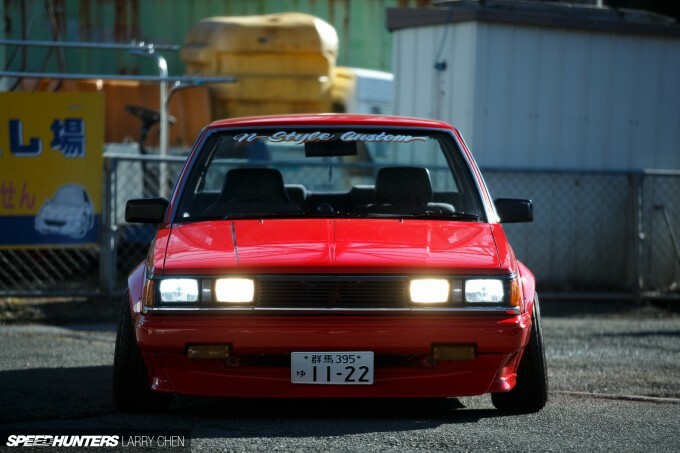 The 4AC version is pretty much an AE86 SR5. 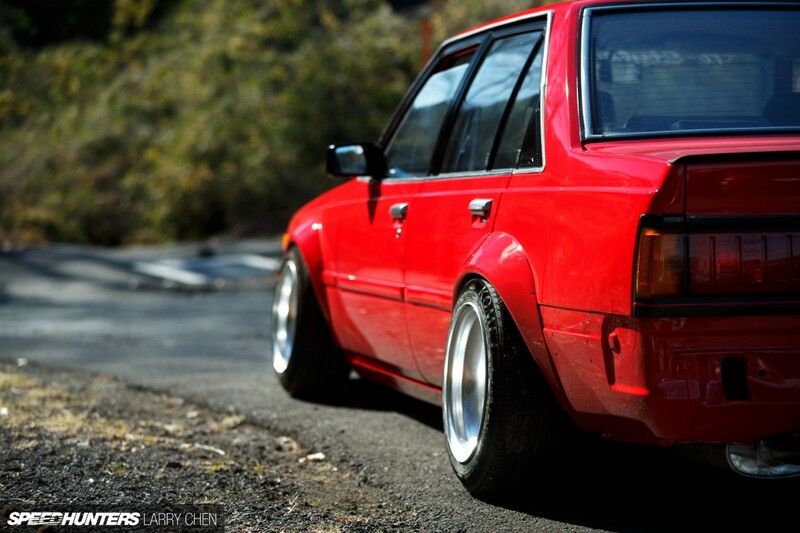 A complete coilover set for AE86 is a drop in for Charmants. its not that people dont like these, its that they didnt make it to some countries.